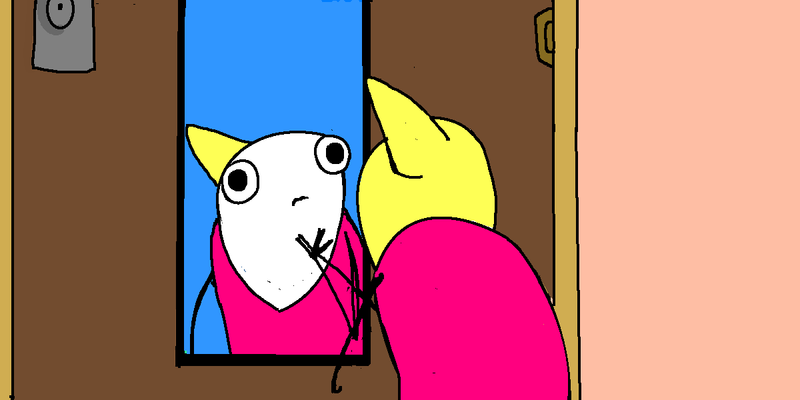 Image by Allie Brosh, again. It’s been about a year since I wrote a guest post for LtaYL that seemed to resonate with a lot of people. I thought now would be a good time to look back on that post and see if I’d been taking my own advice. We’re always better at dishing it out than taking it, right? Well, here goes. Did I live by my own advice this past year? Oh hell no! I try. But I also listen too often to the voice in my head that says I should be doing more, I should be doing better, I should be doing whatever I’m not currently doing... heap it all on me please, I can take it! But honestly, I can’t do all the things. Nobody can. I do some things really really well, but when I’m juggling too much I let some of the balls drop. What did I do this year that I’m proud of? I led my library through a strategic planning process with a limited time frame and a pretty damn good end result. I presented at a conference in the UK and met some of the most awesome librarians in the world. I finally made myself a website and started a self-mentorship toolkit so people (like me) without official mentors can DIY their way through the transition into librarianship. If that’s you, I hope you find it helpful! I participated in one of ACRL’s Immersion programs on library assessment and I beefed up the role assessment plays in my library. Right now I’m wrapping up a Kindness Audit. I wrote some stuff for legitimate journals: a guest column that just came out and a book review that’s in the cue to be published sometime this year. I’m behind on a writing project with one of my committees. This is one of those things I always have good intentions of catching up on, but time keeps sneaking on and I haven’t caught up yet. (Sorry, committee!) This one haunts me a bit because I hate letting down people who are depending on me, so I write it on my to-do list almost every day. I’m ABT on a second master’s degree and I decided that I’m not finishing it. Really. (Before you try to encourage me to finish, know that I sleep a lot better at night than I did before I “gave up”. And being 7 ½ months pregnant, I really value what little sleeping I do at night.) I learned a lot about higher education and college students and assessment along the way, and I value that knowledge. I’m sure I sucked at some other smaller things. If you know me and you’ve got things to add to this list, by all means let me know. Those are pretty big balls to drop. (Sorry, extending the juggling metaphor, please don’t try to visualize that!) Maybe if I’d taken on less I could have managed to keep up with my thesis and the group article. Maybe I could have managed my time better. Maybe I could have worked more hours. Or maybe I’m human, like everyone else, and it’s okay that we don’t always accomplish everything we want to accomplish. Maybe it’s in our nature to be a little too ambitious sometimes. Maybe I have some things to learn about how to manage my workload. What am I trying to say here? I’m saying it’s okay to try to do all the things, but it’s just as okay that you just can’t. We all try to do our best. I want to make an impact in the library world, but more importantly I want to do my job well so I help my colleagues and our patrons out. That’s what I aim for every day, and it’s the yardstick I’d like to be measured by. Ginger Williams: good librarian. Helpful. Makes my life better by being in it. Ginger Williams is a Reference Librarian/Assessment Coordinator at Valdosta State University. She tweets about cats and beer at @GingerInGeorgia. She is not a rockstar librarian. This is her second post for Letters to a Young Librarian; the first was “You Don’t Have to Do All the Things to be an Awesome Librarian. Really." Wow! I think I felt an enormous weight just leave my shoulders. Thanks Ginger! So happy to hear it, Kimberly! I'm in my first year as a librarian at a boarding school. About three months into the school year, the library director (the only other librarian on staff) left for another job, and since then I've been unofficially in charge... mostly because there was no one else. Since then, our entire platform (ILS/catalog/CMS) has slowly collapsed, and I haven't done much of anything that I was actually hired to do because I was just trying to keep the place up and running. And the whole while, I've been beating myself up because I've felt like I wasn't even doing a *good* job, much less the *amazing* job I had intended to do. (Seriously, I haven't gotten involved in even one single professional association.) My bosses seem completely satisfied, but I look at peers who are publishing and going to the conferences and whatnot, and I just think, where did it all go wrong? So this is a welcome reassurance, and thank you for it. Ginger, you are awesome! I love this post. I just started a new job last month and I've been trying to remind myself of a lot of what you wrote about. Thanks!